Holy and Great Lent began a few days ago and the climate is already solemn and mournful, as befits this period. It is the most beautiful and sweetest season of the year, as we are given a great opportunity for prayer and repentance on our part and absolute devotion which makes this desire even stronger. The worship life of our Church contains beautiful and solemn services, such as the Solemn Vespers, the Great Compline, as well as the Salutations of the Most Holy Theotokos which give us special strength during this period. And the Panagia, as we know, is our greatest mediatrix to our All Good God. Why did the Church place the Salutations to the Panagia during Great Lent? What relationship does it have with the Passion and Resurrection of our Lord which we will shortly experience? The role of the Panagia in the life of each human being is great. She mediates on our behalf to God for the salvation of our souls. For this reason our Church has chosen to integrate the Service of the Salutations with the Great Lent of Pascha. Within this Service, we all supplicate our Mother to support us in our struggle which began just a few days ago. To intercede for us to God for the salvation of our souls and for a happy ending to this struggle, that it may be peaceful and sinless, so that with pure souls we will experience the Holy and Awesome Passion of our Lord and then His bright Resurrection. And the presence of the Panagia in the world is great and salvific in our daily life, especially in big events, such as in war. In 626 A.D., while Emperor Heraclius with the Roman army were away campaigning against Persia, Constantinople was suddenly besieged by the Avars. The Avars had rejected every proposal for a ceasefire, and on August 6th they occupied the Church of the Theotokos of Blachernae. In collaboration with the Persians they prepared for the final attack, while the Patriarch Sergios led a procession around the city walls with the icon of the Theotokos of Blachernae and encouraged the people to resistance. That night, a fierce wind, which was attributed to divine intervention, created a storm at sea and destroyed the enemy fleet, while the defenders caused huge losses to the Avars and Persians, who were forced to withdraw the siege and leave empty handed. On August 8th in 626 the City was saved from its greatest, until then, threat in its history. 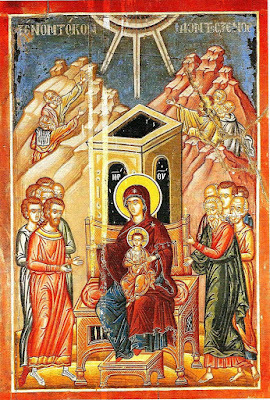 The people, wanting to celebrate their salvation, which they attributed to the assistance of the Theotokos, gathered in the Church of the Theotokos of Blachernae. 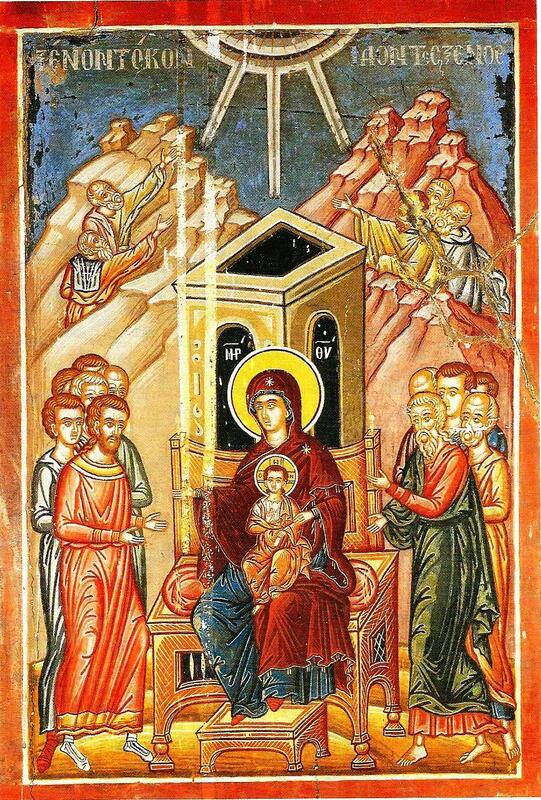 Then, according to tradition, the standing crowd chanted what has come to be known as the "Akathist Hymn", odes of thanksgiving to the Champion Leader of the Roman State, ascribing to her the victory and with gratitude chanting: "To you the Champion Leader...."
This is a living example of the intervention of the Panagia in the history of the world. Her mediation can redeem whole nations, let alone our soul, mediating to God on behalf of our salvation, redeeming us from our passions. Through her, "trophies of victory are raised" and "enemies are defeated" (4th Stasis). She is the "key to the doors of Paradise" (2nd Stasis) and the "bridge leading those from earth to heaven" (1st Stasis). The Akathist Hymn, which has been established since 626 A.D., to show our deep gratitude to the Panagia, is divided into four stasis' of the six letters of the Greek alphabet, the so-called Service of the Salutations, which is chanted every Friday evening of Great Lent, except on the fifth Friday the entire Akathist Hymn is chanted. The poet of the Salutations is considered to be Saint Romanos the Melodist, while the Canon of Praise of the Salutations which is chanted before each stasis was written by Saint Joseph the Hymnographer. From all this we understand that the placement of the Salutations during Great Lent is not accidental. What we will shortly experience will be an awesome and great event and our souls must be pure to experience it, namely the Holy Passion and the most bright Resurrection of our Lord. This is why we supplicate our Panagia to support us during this period with her maternal love and affection, to intercede to our Father in Heaven, that we may complete this struggle we will endure during Great Lent, so each of our struggles for our salvation will be peaceful and without sin, that we may enjoy the Kingdom of God. This is what we express in the verse from the 3rd Stasis, "Rejoice, key to the doors of Paradise," as well as the last strophe of the 4th Stasis, "O all-laudable Mother who gave birth to the Logos, the holiest of all who are holy, while accepting this offering now, deliver everyone from all calamities, and deliver from future punishment those who cry out: Alleluia."